ISLAMABAD, Pakistan (CNN) -- Pakistani authorities have arrested two top leaders of the Islamic militant group India blames for the November massacre in Mumbai, Pakistan's prime minister confirmed Wednesday. 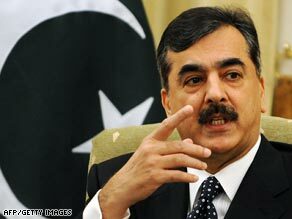 Prime Minister Yousuf Raza Gilani said Pakistani security forces had rounded up a number of militant figures. The top military officer in the U.S. on Wednesday said he is "encouraged" by Pakistan's recent arrests of "significant players" in the Mumbai attacks. U.S. Joint Chiefs Chairman Adm. Mike Mullen said the arrests amount to "first steps" toward determining who plotted the three day siege last month that killed 160 people in Mumbai, India's financial capital. "There are more steps to follow," he noted. He also thanked India for showing restraint against Pakistan, which it has accused of harboring the terrorist groups behind the November massacre. Zarar Shah, a top operational commander of Lashkar-e-Tayyiba, and Zakir Rehman Lakhvi, whose arrest had been reported Tuesday, were among the militant figures rounded up in recent days, Prime Minister Yousuf Raza Gilani told reporters. Gilani would not confirm the detention of Masood Azhar, the leader of another militant group, Jaish-e-Muhammad. But he said his government has launched its own investigation into India's allegations that the gunmen who killed more than 160 people in Mumbai had links to Pakistan. The acknowledgment came three days after Pakistani security forces raided an LeT camp near Muzaffarabad, the capital of Pakistani-controlled Kashmir, in the first sign of government action against Lashkar-e-Tayyiba since the three-day siege of India's financial capital. Both LeT and Jaish-e-Muhammad were formed to battle Indian rule in the divided Himalayan territory of Kashmir, and both were banned after a 2001 attack on the Indian parliament that brought the South Asian nuclear rivals to the brink of war. The United States has listed LeT as a terrorist group with ties to Osama bin Laden's al Qaeda network. According to the U.S. government, Lakhvi, 47, has directed LeT's military operations in southeast Asia, Chechnya, Bosnia and Iraq. Pakistan's Defense Minister Choudhry Mukhtar Ahmed told CNN's sister network in India, CNN-IBN, that Lakhvi and Azhar had been arrested on Monday. Azhar has been in Pakistan since 1999, when he was released from an Indian prison in exchange for hostages aboard a hijacked Indian airliner. Indian authorities say the sole surviving gunman in the Mumbai attacks told investigators that he was trained at an LeT camp near Muzaffarabad, along with the nine other attackers who were killed in the three-day siege. A Pakistani security official said the terror raids on banned militant groups are ongoing and have resulted in at least 15 arrests.